Jennifer Faulconer, aka Princess Genevieve is the ultimate in a character study. When I first contacted her about doing my daughter’s birthday party, she actually responded to me “Dear Queen Kristina”. No joke. She does the Disney Princess giggle, comes dressed in a ball gown, and has an entire kingdom, complete with a map, a flag, and a crest. One of my friends, a former servicewoman who shall remain nameless, couldn’t handle the girly-ness of it all. However, our girls…well, they were, to use Princess Genevieve’s word, enchanted. And she couldn’t speak. Couldn’t even quite look the lovely vision in blue in the eye. Actually, none of them could! By the time Genevieve finished telling her stories and inspecting the treasures that said brother brought down, it was time for some dancing and singing! I would imagine that the Pied Piper couldn’t possibly have gotten a more instantaneous reaction when asking children to rise. The girls all stood up and started slowly moving to “Happy Birthday Princess”. Slowly, one by one, they got comfortable as Princess Genevieve twirled them around the room, and by the end of another song, they were all dancing in a circle to Genevieve’s directions. After that, Princess Genevieve helped with the singing of Happy Birthday and the cake cutting, and without missing a beat, placed herself on the floor among the happiest little girls I have ever seen in my life to talk with them while they enjoyed their refreshments. Kind, happy, and amazingly understanding of the preschool dialect of English that usually only mothers are fluent in, Princess Genevieve talked with the girls while they munched happily and asked her questions. She even encouraged them to say “please” and “thank you”, which instantly won her brownie points with me! When it was time to go, Princess Genevieve floated out the door with hugs and stories about the ball that she had to prepare for. It was lovely and etherial and magical. And then the girls realized what just happened and went absolutely nuts talking to each other about what they’d just witnessed. Savannah is now back to talking to anyone that will listen to her, or that is within ear-shot and HAS to listen to her about the fact that Princess Genevieve came to her birthday party. I’m not sure how long it will last, but I’m glad to know that I could give her such an amazing childhood memory. We get so few, when you think about it. Princess Genevieve and her band of princesses are based out of Azuria, which, for commuting purposes is about the same distance as Warrenton. They will travel the region for a fee based on mileage. In addition to parties, Princess Genevieve is available for events and even Girl Scout badges! She will also do appearances for schools and libraries. With children my daughter’s age, we opted to do a 45 minute appearance. I think that the optimal age for children to really get into the appearance would be 5-7, based on the 5 year old boy we had kicking around (who loved the story telling), and the 5 year old girl (who was the first one to stop being completely spell-bound and participate). However, I think that our 3’s and 4’s did fantastic and had such a memorable time, I would definitely have done this again the same way! 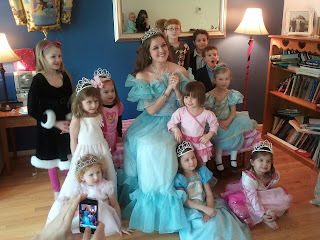 Thanks to Princess Genevieve for making our little princess’ day completely enchanting! Disclosure: PwcMoms paid full retail price for Princess Genevieve’s services. No additional arrangements or discounts were provided in return for this post, and it represents the personal views of PwcMoms.com only.